Paul Hollywood reveals the secrets and versatility of breads from around the world, celebrating the history and traditional flavours of great British bread. The nation may have fallen in love with baking, but for many, homemade bread seems a challenge too far. 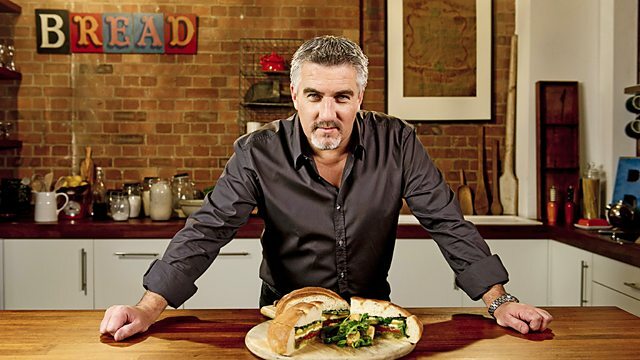 Britain's favourite master baker, Paul Hollywood, is on a mission to share his passion for baking bread in this series. Over six episodes, he reveals the secrets of breads from all over the world and, with a feast of mouth-watering recipes, he shows how even the most humble loaf can be transformed into delicious dishes for breakfast, lunch and dinner. In this first programme, we celebrate the history and traditional flavours of great British bread. Paul explains the basics of bread making by making a classic white bloomer, a gorgeous crusty everyday bread that he transforms into the perfect portable lunch, and his colourful roasted vegetable picnic loaf. We track the history of British bread making from farm to miller, brewer and baker and Paul bakes his ultimate ploughman's loaf, a rye, oat and ale round. For tea, there is nothing better than a slice of Paul's honey-glazed, fruit-packed malt loaf. But his breads are no sideshow, so for a hearty family dinner he bakes his medieval-style rye and wholemeal trencher, a stunning centrepiece flat loaf piled high with watercress salad and sliced, seared lamb leg steaks in a mustard dressing. Celebrating the traditional flavours of great British bread.